Rose Lerner's "In For A Penny"is a Treasure - The More I Read. . . I have to agree with Stephen King when he advises readers to read books sometimes just for a good story, but to treasure that book you find that has both a good story and good words. 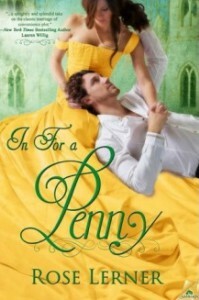 In For A Penny by Rose Lerner is such a treasure with not only a good story and good words but also two of the most genuine main characters as well as a realistic historical background and plenty of in-depth characterizations of even secondary characters. Ms. Lerner's book takes a standard marriage of convenience plot and makes it feel fresh and new. How does she do that? Well, for starters there's Nev, aka Nathaniel Arthur Delaval Ambrey, Viscount Nevinstoke. He's the aristo in need of lots of cash. Nev was well on his way to being a carbon copy wastrel like his father except for two events: his father's untimely death in a duel and a chance meeting with Penelope Brown, a brewer's daughter with a healthy dowry, at a social gathering. His "road-to-Damascus" experience is chockfull of trials and tribulation, but he emerges as a more mature man in the end. I liked Nev in all his incarnations in this book even though he began with a rather typical rakish demeanor who pursued wine, women, and song with a dogged determination. I liked his mischievous spirit that pushed him and his friends, Percy and Thirkell, to blunder through society upending punch bowls and causing orchestras to flee in hysterics. The genuine friendship between him and Percy and Nev's grief when he felt it necessary to cut Percy out of his life added a surprising depth to his character. The death of his father, the realization that his father left his family in financial ruin, and Nev's own insecurity and lack of faith in his abilities turns Nev's carefree lifestyle upside down, and he's forced to accept responsibility for the care of his family whether or not he's prepared or capable. Penelope Brown, "Penny", catches Nev's eye because she's wearing orange (hey, he likes orange), is slender, and dislikes bad music as much as he does. Maybe not a ringing endorsement or the most romantic reasons for attraction, but their first conversation fairly crackled with wit and chemistry. Miss Brown didn’t answer, but she took his arm a little more tightly. Nev decided to be daring and covered her hand with his. She looked at him and quirked a brow, but she didn’t take her hand away. It was small and warm under his, and she was really very pretty, with fine dark eyes, a straight little nose, and a girlish mouth, thin and expressive. Her complexion, framed by straight dark hair, was almost translucent. He suspected she would freckle in the sun. “Would you like to step out on the terrace?” he asked hopefully. “I’m afraid my red sleeve embroidered with great pearls is pinned to my other evening gown, my lord,” she said with ironic courtesy. I was delighted to learn that it is, in fact, Nev who loves Gothic romance and not Penny. Penny's choices in reading, art, and music show so much about her personality. She eschews Minerva Press books, thinks Keats is "a radical hothead", and prefers Boucher's shepherdesses over Fragonard. 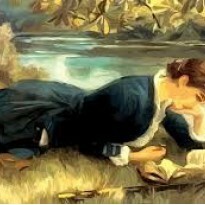 But she is enchanted by Nev's voice as he reads from Keats, noting a "sensitive and engaging" quality made all the more appealing because "he loved poetry and wanted to share it." There's music in his voice that strikes an answering chord within her. While their interests diverge in most things, both Penny and Nev share a love for Arne's arias, and their duet of "Under the Greenwood Tree" underscores why these two are made for each other. Their ensuing relationship echoes this duet throughout the rest of In For A Penny. As a married couple, they are continuously searching for a perfect blending of shared passions, discovering strengths and weaknesses to create the unity of heart and mind and soul from two very different people as well as two disparate backgrounds. Whether it's Penny's practicality, Nev's inherent idealism, Penny's organizational skills and facility with numbers and money, or Nev's ability to put people at ease socially, I loved both of their journeys toward each other. Nev doesn't want to repeat his father's mistakes, a man who had "a great deal of charm", and was "carelessly generous with his affection", but who also was just as "carelessly" indifferent to really knowing his daughter, his son, and his wife. Sadly, Lord Bedlow couldn't have told anyone how old his children were, or that strawberries made Louisa, his daughter, sick, or that her heart's desire for her sixth birthday was a pirate sword, not a doll in a pink satin dress. His wife, Lady Bedlow, poignantly declares upon his death that when he was "in his cups", he was "generally very affectionate." And Nev remembers his father's carelessly given and equally easily forgotten promises to spend some of his time with his family. It's not difficult to understand why he wants to change, but his "all or nothing" belief is hard on him, his family and his friends. Percy Garrett, Nev's longtime friend, sums up Nev's personality succinctly. His dogged determination to be better than his father, or at least his desire not to follow in his footsteps, spurs him to stop drinking cold turkey, dismiss his mistress, and dump his two closest friends. "Nev looked at his two oldest friends and hated his father. But that wasn’t fair either. It was his own fault, his fault for being too weak. His fault for wanting that glass of brandy and a night at the theater with Amy more than anything else in the world. Nev doesn't do anything halfway, and he spares himself nothing when turning over a new leaf, even denying himself his two closest friends. It's Penny's influence that softens the sharp edges of Nev's scorched earth policy. I love Penny and how her family's rise from poverty to "Cit" status influenced the person she is presently, especially her perseverance in the face of insult after insult, including Nev's family. She has been snubbed by the Ton too many times to mention, and yet she soldiers on, striving for some arbitrary ideal of being "a lady." One of the most poignant and heart wrenching conversations about her background occurs when Nev tells Penny how his father reprimanded him for "entering receipts into one of the ledgers" because gentlemen don't dabble in "petty financial details." Penny is perplexed because Lord Bedlow's lack of financial stewardship led his family's ruin even as she knows that she isn't truly a "lady." "Why does it bother you so much? You spend so much time trying to be a lady, and - "
She tensed in his arms. "And failing?" "No. And missing chances to be happy." She acknowledges these are "a child's reasons", but events from childhood have long lasting effects, shaping and moulding the adults we become. Just as Nev learned by his father's example what a gentleman's pursuits and duties were. Just as Penny learned that she is someone "less than" those girls who were ladies by birthright more than their actions. Penny's journey from that "fat, freckled little girl" who sounded like a "street urchin" to Miss Penelope Brown was hard fought. At the finishing school, she was heaped with criticism and scorn by her "betters." Nev, shortly after their marriage, notices Penny at breakfast, carefully cutting her food into "ladylike bites", the way she chewed slowly, and took "ladylike sips of tea." Nev's puzzlement about her "refined, sensible, and a little too careful" manner spurs him to tease her a little, unknowingly dredging up one of Penny's painful experiences with the girls at her finishing school. "Are you going to cut your toast into tiny pieces too?" he teased. She flushed. "Of course not. Whoever heard of cutting up toast?" Nev feels anger as well as guilt for embarrassing her and wonders "if he would ever know the right thing to say again." But Penny's "stubborn perversity" won't allow her to admit defeat then or now. She constantly corrects her course and eliminate those behaviors or traits that scream "common." Penny's time at Miss Mardings' school was very difficult to endure, but she was determined not to show how hurt she was by their slights, insults, snubs. Instead, her struggle to fit in turns inward, resulting in a nervous stomach. Of course, the girls were quick to assume she was suffering from "a shocking illicit pregnancy." After all, she was common, wasn't she? One of the big differences between Penny and Nev is his ease in social situations. Whether he's distracting a little boy with a disappearing sixpence or ensuring Louisa and his mother don't come to blows at a soirée, Nev has a facility for finessing socially awkward situations. Penny retreats into a somewhat cold and severe aspect when faced with potentially explosive social situations. While her heart and intentions are usually in the right place, she does blunder badly. For example, Penny had an understanding with Edward Macaulay that someday they would marry. Theirs wasn't a grand passion but was a close friendship with many shared interests. But Penny accepts Nev's proposal without a single thought to Edward, and then very inadequately fails to explain why. Despite Edward pleading with Penny to change her mind, she refuses and offers only very brusque reply. Her letter reduces Edward to no more than a pesky insect to be swatted away, instead of a valued friend. He doesn't try to plead his case again, but on her wedding day he sends her engravings of Hogarth's Marriage a la Mode. Penny is devastated by the loss of his friendship. This isn't the only time her lack of social graces bites her in the rump, but this incident serves as a rationale for yet another misstep with Nev. Penny quickly realizes at Percy Garrett's disastrous interview for position of steward at Loweston that Nev had probably cast Percy aside as "clumsily and cruelly" as she had cast aside her best friend, Edward, upon her engagement to Nev. She quickly sets out to right things between Percy and Nev in the most efficient manner possible. "She did not always understand Nev; she knew that. But in his expression now, with blinding clarity, she recognized her own emotions as she had stared at the wreckage of her closest friendship. His face went blank with shock, and inwardly she shrank back. But there was no way out of this but forward. Her father had told her once that if you bullied a man into a deal, you’d better get the papers signed straightaway. Give him time to think it over and he’d weasel out somehow. Her desire to reunite Percy and Nev was foremost in her mind and heart. It was an unselfish act meant to heal the wounds between Nev and Percy, but her harsh, cold, insulting delivery drove a wedge between her and Nev that took some time to bridge. The romance between Penny and Nev was absolutely wonderful. Nev takes the time to get to know Penny before consummating their marriage. I loved that Nev isn't one of those "est" heroes. You know, the "tallest", the "broadest" shoulders, the "handsomest" face. He's certainly not the "cleverest", at least as far as numbers and math. He's really just rather ordinary looking, and Penny finds herself most affected by his voice at first. "Nev?" she asked, and he would have given her anything. "Will you read to me?" I love the little things they do for each other to show their love for each other. Loving someone doesn't have to mean grand gestures. Instead, it could be something as small as knowing how much sugar to add to his cup of coffee, or cutting up her food into bite-sized pieces because she finds food from buffets awkward and crumbly, or knowing the "obscene amounts of honey" to add to her tea, or just sitting in a window seat reading from a book they both like. In For A Penny's secondary characters like Percy, Edward, Amy, Mr. and Mrs. Brown, and Lady Bedlow and Louisa have a depth that surprised me. I enjoyed the detail of the social commentary running through the book, the harsh realities of farmers, the schism between merchant class and aristocracy, the effects of the riots of 1816. Mr. Snively is well fleshed out as part of the villain's retinue and, unfortunately, reminded me of Snidely Whiplash of Dudley Do Right fame. Even Sir Jasper is a somewhat sympathetic villain when his experience in Paris in 1789 as a boy is taken into account. I liked that Nev and Penny's problems are not magically solved by the end of the book. Their problems were significant, and it would've been unrealistic and easy to wrap them up neatly with a bow. Mama Bedlow doesn't suddenly like Penny, and the farmers' lives don't improve overnight. The difference is that both Nev and Penny are "in for a penny" in resolving them. I loved that Nev may have chosen Penny because her "pennies" would save his family from ruin, but he was "in for a penny, in for a pound" when it came to loving her. His strengths are Penny's weaknesses and her strengths are Nev's weaknesses. They make a good team. His realization at the end augurs a good, solid foundation for both of them to build on. "Nev looked around the table, at his wife and sister and best friend, and the happiness of the future that he hadn’t been able to imagine burst on him all at once, with interest. Ever since his father’s death, it had seemed that if he did not fix things quickly enough, disaster would strike. Well, it had struck, and they had come out of it whole. He could see now that there was plenty of time. He wasn’t going to get himself shot. There were years and years, and he would learn how to be a big brother to Louisa again, a friend to Percy and Thirkell, a landlord to his people. A husband to Penelope. He was learning already.